Up until today, I had very wrongly believed that when it came to religion and The Little Travelers, I had it covered. It appears that I was wrong, very wrong. It seems that while I’d been busy concentrating on being kosher, on making sure our Mosques and Temples were covered, I’d left out a few minor details. It was information I was sure they knew, hadn’t we talked about it? One of the great things about living in a Muslim country, is you can completely avoid all forms of commercialization in Christianity. No high pitched television commercials reminding you of limited shopping days and no Easter Eggs on the shelves in January. 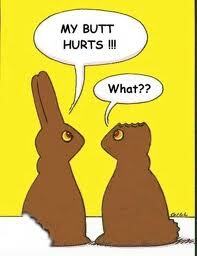 Although, one of the tricky side effects, is that without the prompts, you have no idea when Easter actually is. Not you, or your children. It was the second question that raised me on to my parenting soapbox. “You know, Easter isn’t all about chocolate and bunnies. I think its important we remember why we celebrate Easter” I said this earnestly, while thinking of Lindt Chocolate Balls and how we were going to keep the beagle away from the stash. When your children range from four to ten in age, a few questions from Mum can turn in to a rabid and frenzied display of I know I know, which is exactly what happened when I asked the next question. “Jesus had a birthday!” screamed The Second Little Traveler. I put it down to excitement. I tried an easier question. “On Christmas Eve?” asked the First Little Traveler. “YES!” screamed the eldest child. Without wanting to humiliate and discourage, I raised an eyebrow and checked I’d heard what she’d said correctly. I saw a lightbulb, a glimmer of recognition in her face. “Oops, she said, that was Harry Potter”.